Stellar Flutes have welcomed people into this world and shepherded them into the next. They have helped people through the loss of loved ones, taken the anger out of divorce, assisted in healing the injured. They have calmed the incarcerated, and given direction to the lost. Nothing could make us happier. Tom Stewart founded Stellar in 1995 when by a wonderful series of events he was introduced to the Native American Flute. 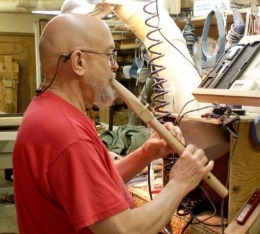 The experience of making flutes, honing techniques, and creatively adding to the flute- making technology has been an engaging, arduous, and fulfilling task. It has come closer than anything ever has to tapping Tom's talents and energies to their fullest. His focus is true and he loves his work. Lily Wilcox is " Stellar, the next generation." 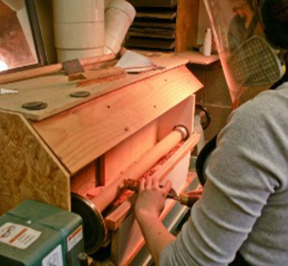 She can take a flute blank and turn it into a beautifully tuned and finished flute. She knows every aspect of the business from wood working to office management. She has perfected the process of applying the flute finish, and in addition to this she does the thread wrap decoration on our Standards. Lily wears many different hats when it comes to Stellar Flutes. She's versatile, talented and hard working. In 2012 KBTC shot this wonderful documentary about Stellar Flutes and our family. It gives viewers a chance to learn more about how our flutes are made and what lead us to be flutemakers.